Sciency Thoughts: Evidence for feeding on schooling shallow-water Fish by a Miocene Beaked Whale. 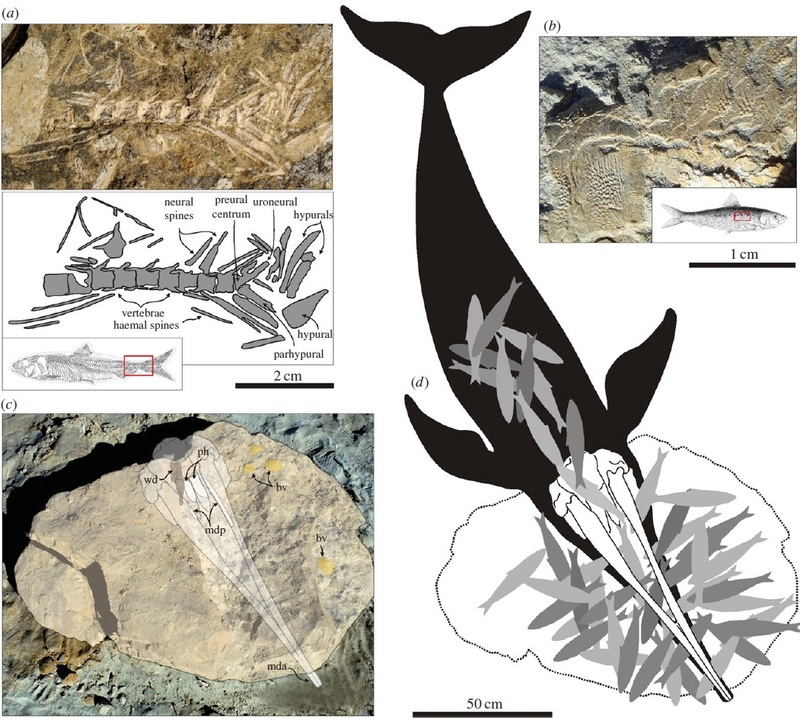 Evidence for feeding on schooling shallow-water Fish by a Miocene Beaked Whale. Beaked Whales, Ziphiidae, are small-to-medium sized Toothed Whales, Odontoceti, which hunt Fish, Cephalopod Molluscs and Crustaceans using echo-location in a similar way to Dolphins. However unlike Dolphins they are specialized for deep-diving, generally feeding at depths ranging from a few hundred to a few thousand meters. This is apparently a very successful strategy, as the group comprise about 25% of all living Whale species. However while all crown group Beaked Whales (the crown group comprises all living members of a group, their last common ancestor, and everything descended from it) are either living species known to practice deep-water diving or show adaptations to deep-water diving, such as fused vertebrae, reduced flipper sizes, enlarged sinuses and reduced dentition, the feeding habits of stem-group Beaked Whales (the stem group comprises members of a group descended from the last ancestral species not thought to have given rise to any living species outside the crown group, i.e. species more closely related to the crown group than to any other group, but still outside the crown group) is less clear, with the transition between shallow-water feeding and deep-diving thought to have occurred somewhere in this group. In a paper published in the Proceedings of the Royal Society Series B: Biological Sciences on 9 September 2015, a team of scientists led by Olivier Lambert of Terre et Histoire de la Vie at the Institut royal des Sciences naturelles de Belgique, describe the discovery of a remarkable death-assemblage in the Late Miocene Pisco Formation at Cerro Colorado in southern Peru, comprising a stem-group Beaked Whale and a large number of Clupeiform Fish (Herring), thought to be closely related to the modern Pacific Sardine, Sardinops sagax. The Pisco Formation comprises two fining-uppward sequences (sequences in which the particle sizes grow smaller upwards) ranging from course conglomerates (sediments containing mixed pebble-sized rocks with an infilling of sand or finer particles, typically associated with beaches, river beds or similar environments) to diatomaceous mudstones (sediments comprising fine clay particles and the shells of planktonic Diatoms, typically formed far from shore in the sea or a wide lake), and separated by an unconformity (missing section in a stratigraphic sequence, typically caused by exposure of the rocks and erosion associated with a drop in sealevel), dated to between 9.9 and 8.9 million years old by the presence of the Late Miocene marine Diatom Lithodesmium reynoldsii. This formation has produced a rich assemblage of vertebrate fossils, including Sperm Whales, Beaked Whales, Dolphins, Baleen Whales, Turtles, Crocodiles, Seabirds, Sharks and Bony Fish. The specimen described by Lambert et al. 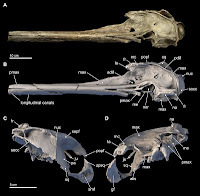 comprises a Beaked Whale assigned to the species Messapicetus gregarius, which is well documented from the Pisco Formation with at least ten known specimens, thought likely to have been female and estimated to have been between 4.1 and 4.5 m in length. This specimen was buried in an inverted position (upside down) with between 40 and 60 well-articulated Bony Fish skeletons surrounding the head and apparently within the chest cavity. These Fish average 38.8 cm in length, with very little variation, and are placed within the Pacific Sardine genus, Sardinops, and are thought to have been very similar to the modern Pacific Sardine, Sardinops sagax. Lambert et al. believe that these fish represent the last meal of the Whale, which has been partially regurgitated following the Whale’s death. They cite a number of lines of evidence to support this theory. Firstly the Whale and Fish skeletons are located within exactly the same stratigraphic layer, and are all well-articulated, suggesting they died within a short time-span of one-another. Secondly the Fish are found only around the head and body cavity of the Whale, positions consistent with a regurgitated meal. Thirdly, despite the rich fossil fauna of the formation, this is the only locality where these Sardines are found, other than a few isolated scales and bones, and the only Bony Fish death assemblage, suggesting that the locality does represent a unique localized event, rather than the fortuitous deposition of a Whale skeleton within a wider Fish bone-bed layer. Fourthly modern Pacific Sardines consume only planktonic Crustaceans, not large vertebrate carrion, making it unlikely that these very similar Miocene Fish were feeding on a dead Whale when they died. Fifthly the size of the Fish closely matches the size of Fish targeted by living toothed Whales of a similar size to the Pisco Formation specimen. Finally the size and number of Fish suggests a total mass of about 25 kg, roughly the same as the masses of Fish produced by stomach content analysis of extant Toothed Whales of similar size. Fossil remains of the extinct beaked whale Messapicetus gregarious and associated Clupeid Fish Sardinops sp. cf. S. sagax found in Cerro Colorado. (a) Photograph and line drawing of the articulated caudal portion of a skeleton of Sardinops sp. in left lateral view (note the typically Clupeid urostyle supporting the caudal fin complex), with a complete skeleton of the modern sardine S. sagax for comparison. (b) Imbricated large cycloid scales of Sardinops sp. in right lateral view showing tubercular protuberances in their central region and curved radii-like lines in their lateral fields, with a body of S. sagax for comparison reporting the putative collocation of the scale set. (c) Dolomite concretion with the skull and mandibles of M. gregarious in ventral view; occipital region, hamular processes of the pterygoids, posteroventral and apical regions of the mandibles emerge from the concretion. Abbreviations: bv, articulated bivalve shells; mda, apex of mandibles; mdp, posteroventral part of mandibles; ph, hamular processes; wd, fragment of fossilized wood. (d) Line drawing of the skull of M. gregarious inside the concretion with a reconstructed outline of its body. Multiple individuals of Sardinops sp. found around the head and in the chest region are schematically represented. Stippled line marks the outline of the concretion. Lambert et al. (2015). The cause of death of the Whale is not immediately obvious. The specimen appears to have been relatively healthy at the time of death, not showing any signs of illness or malnutrition, and apparently feeding normally (typically sick Whales have difficulty feeding). It shows no sign of physical injury, which would be expected if it had been the subject of an attack by a predator such as a large Shark or Sperm Whale. Lambert et al. suggest that it may have died as a result of poisoning, due to toxins produced by a bloom of single-celled algae. Such blooms are a known cause of death in modern Whales, who can either consume the toxic algae along with desired prey, or be poisoned by consuming prey that had itself ingested the harmful algae. The Pisco Formation is known to show evidence by testate (shelled) single-celled algae, and while there is no evidence of such a bloom around the Whale find, lethal toxins are more usually associated with algae that lack shells. Such algal blooms do not (and cannot) occur in deep water, as the algae that produce them are reliant on sunlight to grow. Modern Pacific Sardines form shoals of the same age, and therefore size, remaining with these individuals throughout their lives. All of the Sardines found at the Pisco Formation Whale death site are of approximately the same size, suggesting that these Fish exhibited similar behaviour. 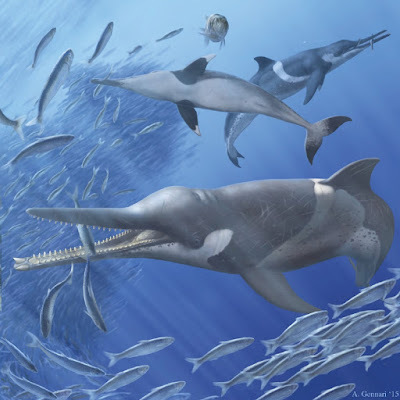 Life reconstruction of three individuals of the extinct Beaked Whale Messapicetus gregarious preying upon a school of aged Sardines Sardinops sp. (average body length 38.8 cm) in the upper part of the water column along the coast of present-day Peru. The front individual is an adult male, whereas the last in the background is a female. Alberto Gennari in Lambert et al. 2015). Modern crown group Beaked Whales are all deep-water feeders, but the ancient stem group Beaked Whales from which they descend lack the specialist adaptations that enable their descendants to do this, suggesting that they were shallow-water feeders. 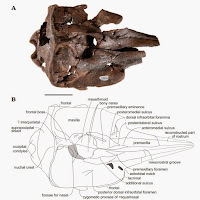 This theory is supported by the discovery of a Whale from the Miocene of Peru which apparently died shortly after feeding in a shallow-water environment. 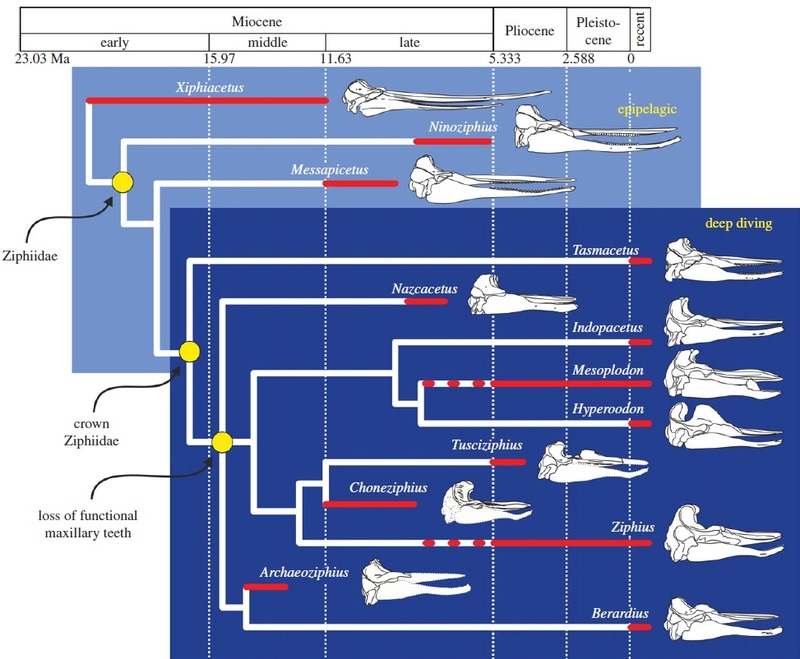 The last of these stem-group Beaked Whales appear to have lived around the end of the Miocene, after which they disappeared, leaving only the crown group Beaked Whales, which appeared in the Middle Miocene and which feed in deeper waters. 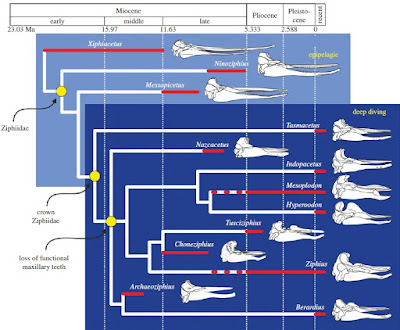 This disappearance of the shallow-water Beaked Whales coincides with the appearance of modern Dolphins towards the end of the Miocene, a group which radiated rapidly and spread quickly around the globe. Lambert et al. suggest that these early Dolphins may have competitively excluded Beaked Whales from shallow water environments, leading to the demise of the stem group Beaked Whales. Phylogenetic tree illustrating the relationships between extant and part of the extinct Ziphiids. The outgroup is the Eurhinodelphinid Xiphiacetus. Red lines indicate stratigraphic ranges. Dotted lines indicate uncertainty for the age of some members of a genus. Separation between epipelagic and deep-diving taxa is based on morphology, platform versus deep-sea deposits for fossil taxa, stomach content analysis for Messapicetus, and optimization of the deep-diving ecology of most extant genera on the phylogenetic tree. Lambert et al. 2015). 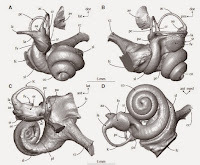 Trying to understand hearing in an Eocene Basilosaurid Whale.